Their annual national meeting over the weekend got off to a rocky start, but Norway’s Conservative Party (Høyre) still managed to launch some new political proposals and firm up some old ones. A vote to allow free birth control pills to girls under age 16, however, may not get much farther. The Conservatives found themselves gathering under the cloud of last week’s shocking arrest of their government’s justice minister’s live-in partner on charges she set fire to their car. She’s also under investigation for being behind a series of other threatening incidents at their family home in Oslo over the past few months. 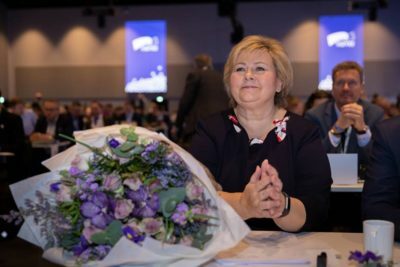 Once the initial shock wore off, however, Prime Minister Erna Solberg seemed determined to steer her party meeting’s agenda back to the politics at hand. The Conservatives’ youth organization (Unge Høyre) won approval for their proposal for free birth control pills and also for a ban on advertising for plastic surgery. Since the legal age for sexual consent is 16, only those older have qualified for free p-piller, as they’re called in Norwegian. Two of the Conservatives’ government coalition partners, the Progress Party and Christian Democrats, want to maintain the ban on free birth control pills for girls under 16. “It’s been there not least to protect children and youth against unwanted sexual behaviour and pressure from others,” Geir Jørgen Bekkevold of the Christian Democrats told news bureau NTB. It’s thus not certain whether the coalition will forward the proposal to Parliament. In other matters, the Conservatives maintained their opposition to both euthanasia and a ban on begging. They also want to reverse their compromise in government negotiations last year that resulted in fathers needing to take one-third of the paid parental leave offered when a child is born. They want the parents themselves to decide how to share the leave that no longer is simply maternity leave. A majority at the annual meeting held at Gardermoen over the weekend also approved maintaining all the tax incentives currently enjoyed by Norwegians who buy electric- instead of conventional cars, at least until 2021. Debate is rising that current advantages like exemption from road tolls, major taxes at time of purchase, free parking and charging and using commuter lanes are now putting an unfair burden on conventional car owners, not least as road tolls soar in most Norwegian cities. The Conservatives also want all welfare recipients to take part in some form of work or activity for the social good, expanding the requirement to all age groups and not just youth. The party further approved another reduction in company taxes, an increase in the standard tax deduction and eventual phase-out of the annual tax Norwegian’s must pay on their taxable net worth (called formueskatt). The party firmly rejected, meanwhile, to even evaluate a future reduction in the tax incentives enjoyed by the oil industry. NTB reported that only three of 298 delegates voted in favour of the proposal that came from a lone delegate from Vestfold og Telemark. The Conservatives claimed they are concerned about climate change, however, and approved measures to make Norwegian harbours zero-emission zones by 2030 and promote development of electric aircraft. There was also the usual cheerleading at the annual meeting, with speeches aimed at revving up the troops especially in advance of municipal elections this fall. Trond Helleland, leader of the Conservatives’ delegation in Parliament, claimed that the left-center side of Norwegian politics was in chaos,with Labour Party leader Jonas Gahr Støre “losing control” over the left and allowing the Reds to win more voters than many of the other small parties. He also made a point of highlighting differences among the opposition parties in Parliament, with the Center Party wanting more roads and lower road tolls while the Reds, the Socialist Left and the Greens all want the opposite. Labour, meanwhile, “changes its position on oil policy depending on which MP you ask,” according to Helleland. There are plenty of such differences among the four parties making up the current Conservatives-led government, too, but Helleland opted against highlighting them. The Conservatives emerged from their annual meeting appearing relatively united in comparison with the internal splits found in several other parties from Labour to the Liberals, but still face challenges in keeping their new majority coalition together with the Progress Party, the Liberals and the Christian Democrats.